Kettering Town’s Evo-Stik Southern League Premier Division season has been winding down for a number of weeks now. 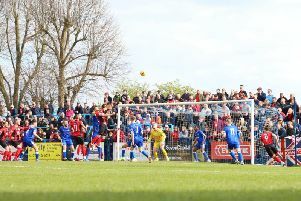 The Poppies’ campaign has fallen short of expectations from the boardroom and the terraces at Latimer Park after Marcus Law’s men were unable to sustain a serious challenge for the play-off places. Kettering will secure a top-10 finish regardless of what happens in the final game of the season at Banbury United on Saturday but it’s clear their inability to challenge for promotion has left many around the club frustrated. Law, however, insists his focus is already switching to next season as he bids to deliver on what was hoped would happen this time around. And it seems early moves to secure some of the current squad as well as new signings are already being made. “Our focus is on what lies ahead for next season,” Law said. “There are three members of the current squad who are on the verge of sealing a deal for next year. Law has come in for plenty of criticism from Kettering’s supporters this season. Frustration has grown throughout the campaign with the Poppies often showing glimpses of what they are capable of but being unable to produce it on a consistent basis. Law is adamant that the form at Latimer Park has been the main reason behind them not being able to challenge for promotion. He firmly believes that comes down to “mentality” and he insists the summer recruitment will be based around that buzzword. “It is mainly a mentality issue that we are looking to resolve,” Law added. “Throughout a large portion of this season, we haven’t been able to overcome the approach teams have taken when coming to our ground to try to get a draw. “We have to look at going about things in a different way to overcome that because there’s no doubt in my mind that our home form is the reason why we are going to finish eighth or ninth. The Poppies will definitely be without Liam Canavan for the last day of the season. The midfielder has also missed the last two games after suffering broken ribs in a car accident last week.